Winery/Producer: Chateau Jouclary; Languedoc, France. Grape Variety: Rosé blend: 30% Syrah, 30% Grenache and 40% Merlot. He said: Served slightly chilled. Light salmon color. Floral and exotic fruit aromas. Ripe fruit and a fresh acid taste that goes into a long tart finish. Fruity, dry, minerality and DELICIOUS. A very nice French Rosé. Absolutely refreshing, tasty and simply a good wine on its own. At $8.00 it’s a “run, don’t walk” wine to buy, it’s a quality wine at a bargain price!!! She said: Love it! Forget the old Californian sweet Rosé and embrace the old fashioned Rosé from Europe. Absolutely delicious. 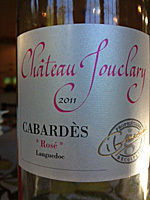 Full of fragrance and flavor this Rosé offers dryness, medium body, and a long finish with a nip of tartness. This is a great bargain wine at $8.